This game is almost similar to GARAGE from Igrosoft that won popularity long ago. 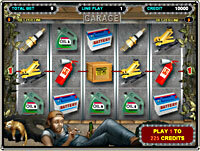 As before, it is still a 5-reel slot machine with gambling game plus two bonus games “Locks” and “Boxes”. The main feature of this slot machine is in bonus games, because there you can get significant win, measured in hundreds and thousands of bets per lines. For example, the average win in bonus games is 35 Total bets per lines, and the maximum win in “Locks” bonus game is more than 500 Total bets. The interface of the new GARAGE slot machine has changed from 2012 version, but it retained logic and controls of its predecessor. Symbols on the reels have retained their values, therefore, payments for combinations per lines do not differ from the original. See payout table below. The significant feature of the new slot machine is that fair play control is added to the game as in all our games. The slot machine has never been so “transparent” for the player. Full layout of the reels indicating the number and order of all 43 symbols is given below. Fair play control system applies to the game per lines, gambling game and of course bonus games. The new fair play control system covers all stages of the slot play, you can read about its details in Slot Machine Fair Play Control section. Fair play control for “Locks” and “Boxes” bonus games has its own features, which can be found below. In the main game, before new spin, you can select the number of lines from 1 to 9 by pressing LINE 1 ... LINE 9. Bet per line from 1 to 25 credits is set by pressing BET. The cost of 1 credit may equals to 0.01 xBTC or 0.1 xBTC. You can spin the reels by pressing START. The symbol KEY WITH A FOB is a wild symbol, it means that it can replace any of the symbols on the reels except GARAGE symbol. In case where wild symbol on any line makes two combinations, the combination is paid with a greater win coefficient. “Boxes” bonus game appears randomly, like other win combinations. Bonus game requires that three or more box symbols appear on the entire screen (on any of the fifteen visible symbols of all 5 reels). Wild symbol can not replace the box symbol and does not affect the appearance of bonus game. Bonus game starts automatically; if in this case win combinations appeared on playing lines, they are paid after the end of bonus game. In “Boxes” bonus game, there are five boxes to the player’s choice. By using LINE 1 ... LINE 9 buttons, the player shall open the boxes in the desired sequence. For finding items in the boxes, the player gets credits. If there is NO ENTRY sign in the box, bonus game ends. In this case, all credits won are multiplied by total bet and added to total credit of the player after returning to the main game. Each of the three tools – wrench, wooden hammer and hacksaw has its own separate cumulative prize that is paid when opening five specified items. Cumulative prize is NOT lost and is kept for the next games in this slot machine. “Locks” bonus game starts in case three or more lock symbols appear on all the reels. The purpose of Bonus Game is to open the garage, by unlocking five padlocks, in this case, getting SUPER PRIZE warrants charging 500 Total Bet to your account. Choosing the right or left safe, you shall find the key to each of five locks. Each open lock brings the player a certain win, which remains safe in case of incomplete bonus game passing. To select a safe, press one of the buttons: LINE 3 (left), LINE 7 (right). If the player has selected a safe without a key inside, bonus game ends. One of the safes contains the key. All credits earned in “Locks” bonus game are, multiplied by Total bet and added to total credit of the player after returning to the main game. By the time “Locks” bonus game starts, the player may have SUPER KEY. At the request of the player, SUPER KEY can be used to open a lock (LINE 9 button). If in the main game, you see only two locks on the screen, one part will be added to SUPER KEY. For get SUPER KEY, you need to collect nine of its parts. Parts of SUPER KEY already got, are kept for future games. The website has a demo version of slot machine available without registration. This game is for familiarization with a new interface, so the way to open bonus game is simplified. Ways of reel stopping and gambling game of GARAGE slot machine are the same as the mechanisms previously detailed in Slot Machine Fair Play Control on the example of Crazy Monkey slot. Five numbers after BonusBox word (BonusBox=10,9,10,5,12) determine the outcome of “Boxes” bonus game. These five numbers are generated independently of each other, and can take values from 0 to 14. Each of these numbers determines the prize in the box (from left to right), showing the number of credits earned (corresponding to the item in the box). See the correspondence table. Numbers 0, 1, 2, 3, 4, 5, 6 in the table correspond to a value of 0 – which means that there is No Entry sign in the box, and if the player selects this box, bonus game ends. Five pairs of numbers after BonusLock =1|6, 6|1, 9|4, 9|4, 0|5 are used for “Locks” bonus game. Each pair specifies the presence of a key in one of two safes and the amount of credits won, when the safe with a key is guessed. The numbers may take ten values from 0 to 9. In this case, each pair of numbers is generated so that the difference between them is always equal to 5. This provides the obligatory presence of a key in one of the two safes offered to select from. In our example, for the first (lower) pair of safes, numbers 1 and 6 specify the absence of a key in the left safe and the presence of a key in the right safe (number 6). See the table. Number 6 in the table corresponds to 10 credits won in bonus game.